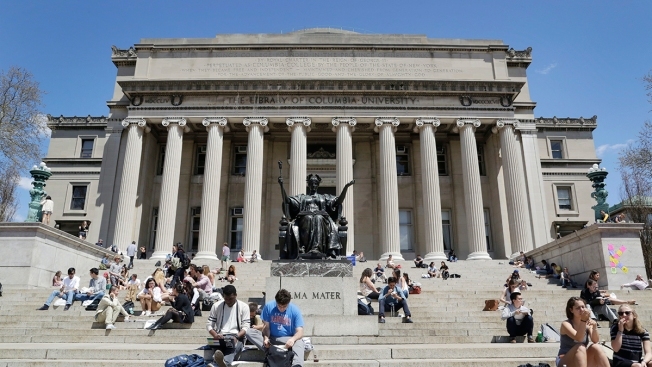 Students sunbathe on the steps of Columbia University's Low Memorial Library next to Daniel Chester French's sculpture, Alma Mater, April 29, 2015, in New York. Video of a white undergraduate student shouting white supremacist remarks at other students on the campus of Columbia University over the weekend has gone viral, prompting university officials to release a statement condemning the incident and promising an investigation. The student, identified by the Columbia Spectator as sophomore Julian von Abele, followed a group of mostly black students from Butler Library to a campus restaurant around 4 a.m. Sunday, shouting, "White people are the best thing that happened to the world." Von Abele, who describes himself online in social media accounts as a physicist, shouted, "We built the modern world! Europeans! We invented science and industry... we saved billions of people from starvation!" He appeared to be intoxicated during his tirade. "White people are the best thing that ever happened to the world," he screeched. "We are so amazing. I love myself! I love white people! F--- yeah, white people. F--- yeah, white men. We're white men, we did everything." "Look, I don't hate other people, I just love white men," he added. The group of students shouted in outrage and groaned in exasperation as they listened to his rant. It's not clear from the video how the encounter between von Abele and the group of students started but a student-run blog at Columbia University, Bwog, spoke to a student who witnessed the rant. The student, Kwolanne Felix, told Bwog that a mostly black group of students was returning from an event and crossing the library when the man began shouting those racially charged statements. "He said those statements just to see if we would react," he told Bwog. "The group stops and starts to converse as we are confused as to who he's yelling at. As he yells, a large argument begins. This is the part caught on video." Felix said after a few minutes, the group gave up on engaging with von Abele, believing he was drunk. They went on to the campus eatery JJ's Place, and while there, met a group of black women who said they'd been harassed by the same man. Von Abele soon walked into the restaurant, continuing his rant. He was confronted by other students, and a witness flagged down a nearby public safety officer, who tried to talk with von Abele. "Ultimately the public safety officer lingers and when we ask for action, the officer replies, 'He is just saying how he feels,'" Felix told Bwog. Von Abele didn't reply to messages seeking comment by both the Columbia Spectator and Bwog. He has not responded to messages from a News 4 reporter on his social media account. Columbia University officials sent en email to the school Sunday night denouncing the "deeply disturbing, racially charged incident" and promising an investigation by the Office of Student Conduct and Community Standards. "We are alarmed at the rise of incidents of racism and hate speech in our world today," the letter said. "It is more important than ever that we continually demonstrate our core values and restate our commitment to a diverse, inclusive community on campus." "At Columbia, we stand firmly against white supremacist language and violence," it continued. The university invited students to an "open reflection" hosted by Multicultural Affairs on campus Monday evening, and promised additional areas of support. Von Abele apparently authored a 218-page book in 2015 titled, "Physics Reforged: The New Theory of Parallel Universes, Hidden Dimensions, and the Fringes of Reality," the New York Post reports. A description of the book on Amazon reads, "Julian began developing new theories of physics in the eighth grade." The Columbia University Black Students' Organization said on Facebook it would be discussing a plan of action during a board meeting Monday. The Columbia University Student Organization of Latinxs said on Facebook, "We also want to stress that this type of incidents do not happen in isolation and we demand that Columbia University sees this as an institutional problem that is perpetuated by its administrative, academic, and business practices."